Microsoft's Skype for Mac is a messaging client that facilitates peer-to-peer video chats, computer-to-phone calling, text messaging, and file sharing. Although some services require a subscription, the basic functions of Skype are available free to users. Subscribers can choose from packages that allow unlimited calls to domestic and international locations for a low monthly fee. 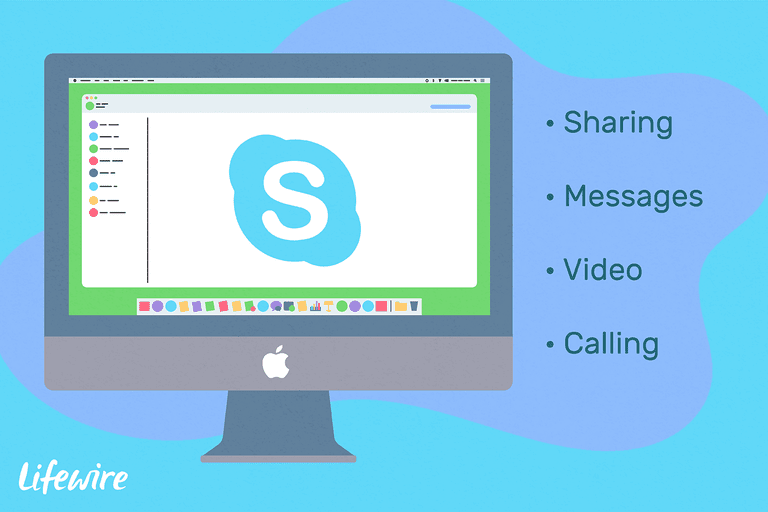 In addition to being a free download on your Mac, ​the Skype app is available for your iPhone, as well as for Windows, Linux, and Android devices. Skype is also compatible with certain Xbox One and Amazon Kindle Fire HD devices. In your web browser, go to the Skype for Mac download page. Click Get Skype for Mac. The Skype installation file downloads to your Downloads folder by default or to whatever folder you select. Open the Downloads folder and double-click the ​Skype for Mac installation file to start the installation process. After you double-click the installation file, a Finder window opens prompting you to add the Skype app to your Applications folder. Drag the Skype logo to the Applications folder on that screen. Launch Skype for Mac by opening the Launchpad in your Mac dock. Find the Skype app icon and click on it. You can also find the Skype for Mac app by going into your Applications folder. Double-click the Skype icon to launch the service. After launching Skype for Mac, you are prompted to log in to your Skype account to begin. You can even use Skype as your home phone.